CLARA is honoured to present Professor emeritus Per Jonas Nordhagen's article on 'Lorentz Dietrichson (1834-1917) and the Beginnings of Systematic Studies on Iconography'. Dietrichson's work has been of large significance to classical archaeologists and art historians far beyond the borders of Norway. We are grateful to Nordhagen for enlightening us and sharing with us of his great knowledge on this illustrious scholar. Read and enjoy! In CLARA's most recent article, 'Who Are You, Beautiful Woman? The 'Mona Lisa' from Sepphoris in the Light of Epicureanism and Neo-Platonism', Nava Sevilla-Sadeh presents a new hypothesis regarding the intriguing and enigmatic female figure in the floor mosaic from the Roman Dionysian villa at Sepphoris in present-day Israel. We hope you will enjoy this latest publication from CLARA! Zoltán Niederreiter presents "Cuneiform tablets, cylinder seals, stamp seals and scaraboids in the Museum of Cultural History, University of Oslo"
The present paper deals with a heterogeneous group: four cuneiform tablets, two cylinder seals, three stamp seals and two scaraboids. This previously unpublished material is held at the Museum of Cultural History, Oslo. CLARA is delighted to publish Professor emerita Saphinaz-Amal Naquib's new article 'Exploring Biographies. Ancient Egyptian Funerary Statuettes at the Museum of Cultural History (MCH), University of Oslo'. Small funerary statuettes shaped as mummiform figurines are among the most common ancient Egyptian artefacts to be found in museums of cultural history worldwide. The MCH is no exception. The present article explores the biographies of material culture, materiality, objectification and shifts in meaning. It probes the many ways small artefacts, often categorized as ‘minor art objects’ of no importance, provide us with valuable insights into ancient Egyptian beliefs, society and culture. Selecting a few pieces from different periods, it delves into the multi-layered narratives and intersecting storylines where the objects’ biographies are tied to a web of relations across time and space as well as to the history of the ancient Egyptian collection at the MCH. The article discusses questions related to museological and heritage management, and addresses ethical issues concerning the provenance and ownership of archaeological artefacts in museums. CLARA is pleased to share with you this new essay where the authors Professor emeritus Røyne Kyllingstad from the Oslo School of Architecture and Design and Professor emerita Ingrid Edlund-Berry from the University of Austin, Texas, revisit the archaeological excavations at Morgantina, Sicily 1961. †Axel Seeberg (1931-2011) was a Norwegian Classical Archaeologist and an internationally renowned expert on ancient Greek vases. 'The first big acquisition' marks the final paper of an impressive and extensive scholarly career. With a preface and further contributions by Professor Emeritus J. Rasmus Brandt, University of Oslo. CLARA Vol.1 is proud too present CLARA REVIEW, an important part of the journal which carry book reviews. 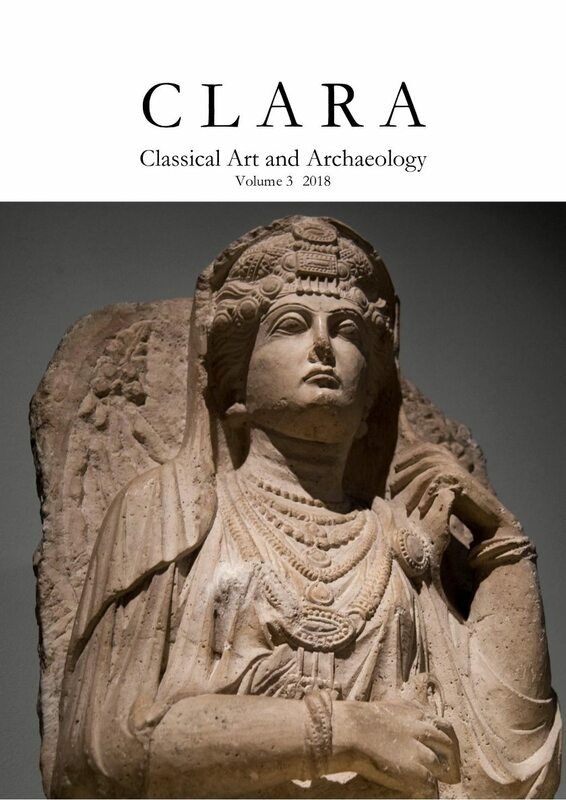 Introducing this part of CLARA is a review of Wiley-Blackwell Companion to Roman Art edited by Professor Barbra E. Borg from the University of Exeter. Throughout thirty chapters, divided into seven parts the Companion deliberate on both the definition and utility of visual art available in the Roman Empire. This author of this solid review is Professor Bente Kiilerich from the University of Bergen. CLARA Vol. 1 is happy to introduce CLARA Chronicle, a part of the periodical which publishes essays and - hence the name - chronicles. First out is a biographical and collection historical essay about the great, Swedish scholar, Professor Arvid Andrén, the man behind the Etruscan Collection at the Museum of Cultural History in Oslo. The author of the essay is Professor emeritus Ingrid Edlund-Berry from the University of Austin, Texas, his student and friend. https://www.journals.uio.no/index.php/CLARA/issue/view/262 Please click on the cover image to enter. A full pdf of the article can be downloaded. More articles will be published over the next weeks and we expect the first volume to include ten, at a minimum. The majority of the articles in this first issue will deal with the Egypt and Antiquity Collections of the Museum of Cultural History, but not all. All texts published in CLARA are peer reviewed and holds a high academic standard. We welcome all relevant proposals! Scholars of Greek and Roman art and archaeology at all levels are invited to submittheir texts to CLARA for peer review evaluation. CLARA is published by way of the Oslo University Library Open Access platform FRITT. All rights and guidelines are available on the periodical’s website.